WELCOME, Farm First member!! How can we help?? Farm First is here to provide you, your family and your operation with the resources, professional and personal support to address a wide range of issues. Give us a call at 877-493-6216. We are available 24/7! For information on all the subjects listed above and more, click here to access our parent organization’s website, investeap.org. You will be asked to log in using your own email address, your own password and the organization password – farm. 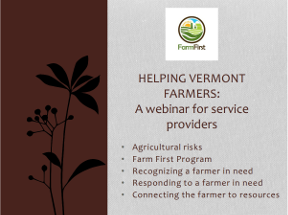 Our mission is to help ALL Vermont farmers address the challenges unique to making a living in agriculture.